Completing his stroke, junior Zach Spalding competed at the Titan Senior Night. He tightens his swim cap, steps onto the platform, and looks at his teammates for the last time before diving into the water. As the shot blares, he leaps into the water, giving his final swim everything he has. 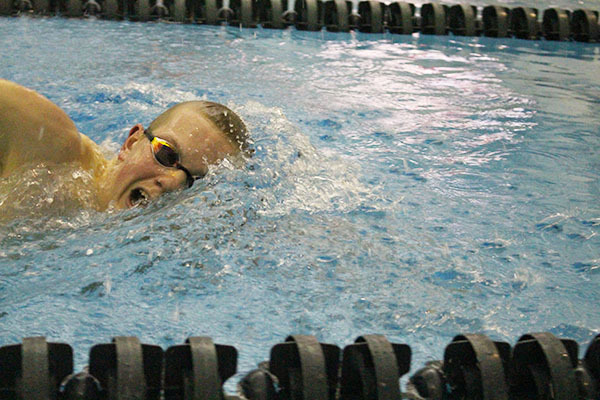 Senior Nick Shechtman competed in his final race, as the Titans swam at the state meet on Feb. 23 and 24. After coming off a sectional championship, the Titans prepared to compete at state once again. The sectional meet proved how strong the team could perform, according to Shechtman. Head coach Keith MacDonald was proud of the Titans’ success at sectionals, and expected the team to perform well at State because of their numerous victories throughout the season. Their success at sectionals was a result of their hard work and passion for their sport, according to MacDonald. Throughout the state meet, MacDonald was anticipating more victories. On a positive note, MacDonald says he is proud the team was able to compete, especially the younger classmen. Shechtman and his teammates junior Cameron Schulte, sophomore Adam Zuiker, and Iida took 12th place in their 200 Medley Relay with a final time of 1:36.18. Shectman says that even though few events placed for the Titans, the team’s depth will go a long way for the program. Shechtman says that the Titans were not as victorious at state because two of their top swimmers sophomore Elliott Chen and sophomore Michael Hadjiivanov were unable to compete at state due to illness. Even though the Titans did not perform as well, they still enjoyed their time at State, according to Shectman. According to Iida, he is excited and ready for his next three years swimming at GBS. Iida was able to break the GBS record for the Men’s 100 breast with a time of 0:57.57 at State. He is apart of the seven out of the eight state qualifiers who will be returning next season. According to Shechtman, as he waves goodbye to his GBS swim career, he reflects on all four of his seasons as a Titan swimmer.